Peters Revington&apos;s Oslo living room accent collection from Carolina Furniture reminisces of architectural design in a pure natural form. Bold bordering lines and iconic iron legs frame each table in knotty cherry veneers while rectified stone tops reminisce of sunny cliff-side bays. High-quality craftsmanship completes each of the cocktail tables in this collection, adding small functional drawers with decorative hardware pulls and smooth finished shelves for storage and display. 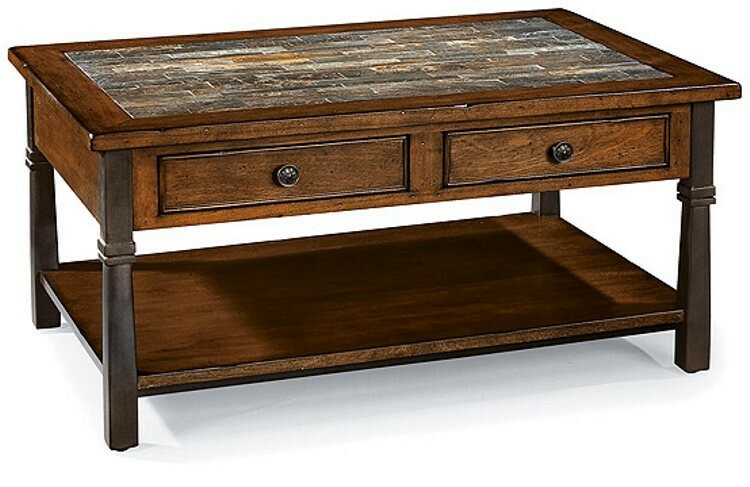 Complimenting casual atmospheres in traditional, formal and cottage style homes, this collection of end tables, cocktail tables, coffee tables and hall tables gloss over living rooms with natural rustic auras.